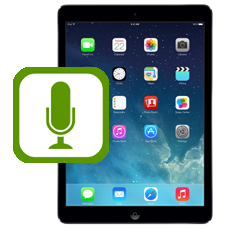 If no one can hear you when you are on a FaceTime or Skype call when using your iPad Air, the odds are the microphone is faulty. Allow our expert technicians to replace the microphone assembly inside your iPad Air, this repair involves removing the complete front screen so is not advised to be undertaken at home. * We always aim to complete repairs as fast as possible. This is an in-house Apple iPad Air repair service, when ordering this service you are required to ship your iPad into our repair centre for works to be undertaken.